By Genevieve Cathcart – Solicitor, Resi & Commercial Property. Published 24 July 2018. Japanese Knotweed is on the rise across Northern Ireland, an invasive non-native weed, it is known for spreading rapidly and is strong enough to break concrete. Japanese knotweed is the cause of approximately £170 million worth of home repairs in the United Kingdom every year and is causing problems for developers and private homeowners. Japanese knotweed can result in homeowners having difficulty in selling their property due to the unwillingness of mortgage providers to lend on homes that have been affected by, or are in close proximity to the weed. In February of this year the Truro County Court delivered a judgment in Adam Smith and Eleanor Smith v Rosemary Line. The court held that Ms Line was liable in common law nuisance for a 10% diminution in the value of £500,000 for Mr and Mrs Smith‘s property for allowing Japanese knotweed to invade their garden. The decision was made on the basis that while it is not illegal to have knotweed on land, it is illegal to allow it to spread. As a result, Ms Line was ordered to employ a contractor to remove the knotweed and pay court costs. Back in April 2017, the Cardiff County Court in Williams v Network Rail Infrastructure Ltd and Waistell v Network Rail Infrastructure Ltd, decided that Japanese knotweed was an actionable interference before it caused physical damage on adjoining land because of its effect on the use and enjoyment of the claimants’ land. In this case, Japanese knotweed which was growing on land owned by Network Rail (present for at least 50 years) was in close proximity to residential properties. Two of the homeowners, Robin Waistell and Stephen Williams, brought civil proceedings against Network Rail as their homes were affected. 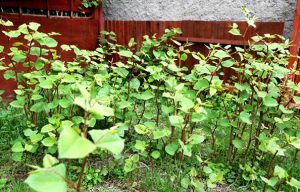 The homeowners claimed their properties had decreased in value and were difficult to sell because Network Rail had not taken sufficient steps to control the Japanese knotweed growing onto their land. The Judge found that their properties had suffered from encroachment and the presence of Japanese knotweed interfered with use and enjoyment of their properties. The court explained that the presence of Japanese knotweed on the neighbouring land was an actionable interference with the use and enjoyment of the homeowner’s property on the basis that it interfered with the individual’s ability to realise the full market value for the property. Though Network Rail challenged the decision, the Court of Appeal ruled that the homeowners were entitled to damages for the cost of treatment because the plants roots extended beneath both of their properties, with the Judge describing it as a “natural hazard”. However the homeowners were not entitled to seek damages on the basis that it has reduced the value of their properties. These cases are significance as they place a positive duty on landowners to ensure that Japanese Knotweed on their property is not preventing neighbouring owners from being able to sell their property for market value. This article has been produced for general information purposes only and does not constitute legal advice; further advice should be sought from a professional advisor.